What is a Faraday Flashlight? 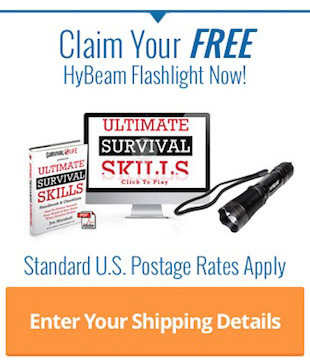 You’re probably here because you want to buy a new flashlight and are trying to make sure you get the right flashlight for the best possible price. But there’s a bewildering array of choice out there, and a huge amount of jargon for the first-time buyer to wade through. We aim to cut through all the technical talk and explain things in ways that are easy to understand. And for the more sophisticated purchaser, who already knows their lumens from their LEDs, our in-depth comparison guide is the perfect place to track down the exact features that you want in your new flashlight. 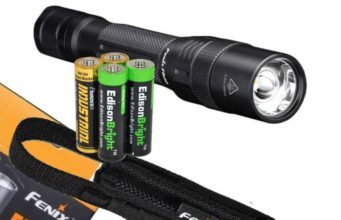 Whether you’re in the market for a tiny keychain light, or a massive 6D cell light that will do double-duty as a baseball bat, we’ll set you on the right path to finding the best flashlight for your needs. What should you look for when buying a flashlight? The single most important consideration is what your intended use will be. This drives the size and weight requirements, and ultimately narrows down your choices immediately. Every-day carry (EDC). Here, you’re likely to be looking for something compact – or perhaps even tiny enough to go on a keychain. Size and weight will be the primary factors you’ll consider. Headlamp. These head-mounted flashlights are becoming increasingly popular amongst runners, hikers, cyclists and anyone who needs to throw extra light while leaving their hands free. Weight, power output and battery life will probably top the requirements here. Tactical flashlight. To use in conjunction with (or sometimes as) a weapon. Durability, weight and reliability are key. And prices can be higher as you’re paying for higher-quality materials. Throw flashlight – when you need a bright beam that travels as far as possible. Power output is the probably the most important item on your list here, followed closely by battery type and run time. Size still matters, but you’ll know yourself how much of a difference an extra few ounces makes. Survival or hand-cranked flashlight. When you’re in a situation when you REALLY need your flashlight to work, different considerations come into play. Can you rely on the batteries? Is it waterproof? Can you use it to signal help? (Or perhaps it even has a mode that will automatically send out an SOS?) Or maybe you’ve clicked the on-switch and found your flashlight batteries are dead once too often? Then a hand-cranked or hand-powered flashlight may be the answer for you. Rechargeable. Batteries aren’t cheap, and if you use your flashlight enough, then the rechargeable option may be one that makes sense to you. The main decider here is whether to go with removable or non-removable batteries – with pluses and minuses on both sides. So the first question is: what are you going to be using the flashlight for? Once you’ve got this straight in your mind, you can head over to our in-depth buying guides to narrow down your choices. Or continue on this page if you want to learn a bit more about the terminology used. While not all flashlights are created equal, they tend to share similar features, so the guide below is a good general-purpose illustration. Bezel – this overhangs the front of the flashlight and helps protect the lens from knocks. In some lights, this area will twist and allow the light to be focused into a wider or tighter beam. It may even be used as the switch to turn the light on or off. Head – this is where the bulb is housed. Bulb – usually nowadays the bulb will be a long-lasting LED (light-emitting diode), but you may also find the older incandescent type such as krypton bulbs in some models. Battery compartment – where the batteries go. It’s usually accessed by twisting open the barrel of the flashlight, or perhaps through a door in the side. Rechargeable models may not have an accessible compartment at all. 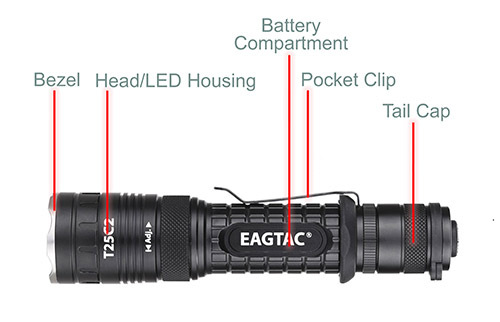 Pocket clip – restricted to smaller flashlights. Lens – the glass or plastic cover at the front of the flashlight. Often, this is just a protective cover, but in some cases it will act to focus the beam in a particular way. Reflector – this bright, shiny material surrounds the bulb at the front of the flashlight and ensures that the maximum amount of light is thrown forwards. In some flashlights, twisting the focus ring will move the bulb forwards or backwards within the reflector to alter the shape of the beam produced. Switch – In the example, it’s a push-button tail switch. The use varies from flashlight to flashlight. Some are simple on-off buttons; others have different modes depending on how many times they’re pressed; other types again may be slide switches instead of push buttons. Fortunately, the ANSI FL1 standards for flashlights that were introduced in 2009 give an easy way to compare the performance between manufacturers. All models are tested and rated in the same way, with most major brands using the performance data on their packaging and sales materials. Simply put, how bright the flashlight is. It is measured in lumens, which is related to candle-power, but in a complicated way depending on how wide an angle of light is being produced. Small flashlights might only produce 20 lumens (enough to help you guide your key into the keyhole), while more powerful models might produce an eye-watering 3,500 lumens. Battery life, or Run Time, will be directly affected by the light output. Read our guide on how light output is measured. Whereas the lumens measurement above tells you how much total light is being produced by the flashlight, the Peak Beam Intensity measure relates to the brightness of the brightest point in the beam. It is measured in candela. This is measured in metres, and relates to how far the light will shine before the brightness has faded to the equivalent of a full moon on a clear night. 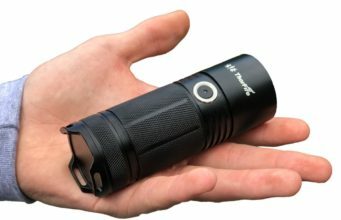 This is considered a safe amount of light for outdoor travel, so is effectively the maximum distance the flashlight can produce an adequate amount of light. If there are multiple power modes, the distance will vary with the setting selected. Measured in hours, this shows the time it takes the light output to drop to 10% of its initial output. Depending on the type of flashlight, the decrease in light output may be gradual, or there may be a sudden, sharp drop in performance. Manufacturers sometimes provide a Run Time graph showing the output of the flashlight over time. If there are multiple power settings, Run Time is usually stated for each brightness level. This is a test of the height in meters from which the flashlight can be dropped onto concrete and still work properly. After the test, the flashlight must be entirely without cracks, breaks, or any reduction in water resistance. IPX4 – shows that the flashlight is splash resistant from all angles. IPX7 – the flashlight is capable of temporary immersion in water of up to 30 minutes at a depth of 1m. IPX8 – the flashlight is capable of submersion for up to four hours at the depth specified. Almost every flash light these days uses an LED bulb, for the simple reason that they’re the best option available. In terms of energy efficiency, coolness, battery life, brightness and durability, they’re by far and away the leader of the pack. Certain models will still use the older style of incandescent bulbs, but these are few and far between. Read our guide to Flashlight bulbs – Incandescent versus LED. – Flood. This is a fixed setting for the flashlight to throw as wide a beam as possible. It’s useful in settings such as walking, or general purpose tasks around the house or campsite. – Spot. This is again a fixed setting, but with a tightly-focused beam. This has less general-purpose usefulness, but is handy in situations where you want to concentrate the light in a particular area. – Adjustable. The most versatile flashlights allow you to adjust the beam type, giving you the option to have flood or spot lighting as the need arises. There may be a slight increase in size and weight to allow for the focusing mechanism. For some, the type of replacement battery used will be as important a decision factor as size and weight. Disposable batteries: Typically, AA or AAA are the most common sizes and replacements are easily found. However, you’ll also see CR123A as a regular alternative. These batteries are more expensive and are not as widely available, but they have the advantage of a high output voltage for their size and weight, which usually results in a smaller, brighter flashlight. At the opposite end of the spectrum are the D cell batteries, with anything up to six batteries lending the flashlight the appearance (and sometimes utility!) of a security baton. Rechargeable batteries: These are usually lithium-ion (Li-ion) batteries that cannot be removed. The most common charging method is via a USB connection from a computer or other power source. Rechargeable flashlights cost more to buy, but their lower running costs make up for this over time. For more detail, read our guide to the different options for flashlight batteries. 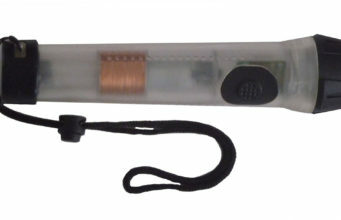 Most flashlights have push-buttons or slide switches for the on-off and mode functions, and these are typically thumb-operated. Some flashlights have a rotating bezel at the front or back to turn on the light. These require two-handed operation and can be inconvenient to some users. Some lights feature a part-press function whereby you can switch on the full beam by slightly pressing the switch. A full press then turns the flashlight on properly. 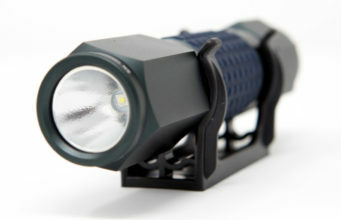 Cheaper flashlights will often have just a single mode of operation – the light is either on or off. While for many purposes, this is all that is required, sometimes having the option to change power levels is useful. Some models will offer high and low power modes, or even a variety of different power levels. The main point to remember is that the different power levels will have a huge impact on battery life. Manufacturers will rate the battery life for the various different power levels, so it’s important to check how long the battery will last for both the high and low power settings, if this is a feature you require. Light Rabbit is dedicated to ensure you with the latest LED innovative technologies for making your home or office either any other premises brighter and cost effective from budget point of view. Have a look at this weblink for more details.